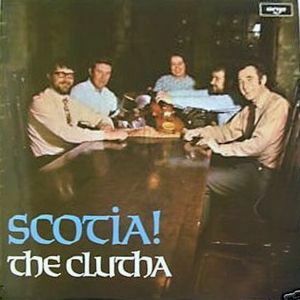 (1971) The Clutha – Scotia! The Clutha were formed in 1964 by four colleagues who worked at the Mitchell Library in Glasgow: Eaglesham, Voy, Alexander and Don Martin. By the time they made their first recordings (for the Topic compilation album The Streets of Glasgow in 1965), Martin had left and fiddler Callum Allan had joined. Gordeanna McCulloch, who also appeared on the Streets of Glasgow album, joined the group not long after, at the age of 19, having also recorded for Topic for another 1965 compilation album, New Voices From Scotland. She’d got involved in traditional song as a schoolgirl at the Rutherglen Academy in Glasgow, where Norman Buchan ran a Ballads Club. As a teenager, she had been invited down to London by Ewan MacColl to join in his Singers Club seminars. They were only with Argo for this, their first solo album. In 1974, they were back on Topic for The Clutha – Scots Ballads, Songs & Dance Tunes. By the time of their 1977 release, The Bonnie Mill Dams, Eaglesham had left and Jimmy Anderson had joined the group on chamber pipes and bagpipes. ~ by folkcatalogue on October 22, 2009.